Superstition is common and causes discomfiture or fear, especially in patients who have to undergo surgery for cancer. One superstition is, that moon phases influence surgical outcome. This study was performed to analyse lunar impact on the outcome following lung cancer surgery. 2411 patients underwent pulmonary resection for lung cancer in the past 30 years at our institution. Intra-and postoperative complications as well as long-term follow-up data were entered in our lung-cancer database. Factors influencing mortality, morbidity and survival were analyzed. Rate of intra-operative complications as well as rate of post-operative morbidity and mortality was not significantly affected by moon phases. Furthermore, there was no significant impact of the lunar cycle on long-term survial. In this study there was no evidence that outcome of surgery for lung cancer is affected by the moon. These results may help the physician to quite the mind of patients who are somewhat afraid of wrong timing of surgery with respect to the moon phases. However, patients who strongly believe in the impact of moon phase should be taken seriously and correct timing of operations should be conceded to them as long as key-date scheduling doesn't constrict evidence based treatment regimens. Superstition is very common, especially in some rural areas where nearly one-fifth of the population believes in the impact of moon phases on various phenomena and, among other things, outcome of medical treatment [1–3]. These patients may be anxious, especially when they have to undergo surgery for cancer . The rationale for these anticipated effects have been credited to variations in the brightness of moonlight, weather conditions, geomagnetic variations as well as interstellar solar corpuscular radiation [5, 6]. "Why should the moon, which causes the tides, doesn't influence human beings, who consist predominantly of water?" is a common believe. Consequently, many patients are essentially afraid of wrong timing of surgery with respect to moon phases, which might manipulate nurses and surgeons [3, 7]. Thus, the impact of lunar cycles on treatment related complications, postoperative mortality and morbidity as well as long-term survival has been widely discussed by television shows, lay press and newsgroups in the internet. Several scientific studies have reported on the influence of moon phases on birth rates, birth complications, suicide, psychiatric crises, or outcome of surgery for breast cancer . Since some studies underline significant influence of moon phases on human life [5, 8–11], other reports have failed to confirm these results [2, 4, 12, 13]. It is well known, that physiological processes of the organism, i.e. the endocrine system, the autonomic nerve system, the liberation of growth factors or the limbic system are influenced by the moon cycle . In addition, it is also postulated that significant impact of lunar phases is mediated by endogenous mechanisms . In patients who have to undergo surgery for cancer, fear of operative complications and poor outcome is very widespread. In some cases, lunar phases are believed to be relevant for success of treatment. Therefore, this retrospective study was performed to analyse the influence of the moon phases on mortality, morbidity and long-term survival following lung cancer surgery at our institution. We retrospectively reviewed the files of 2411 patients with complete long-term follow-up who received resective surgery for lung cancer between January 1980 and December 2007 at the Department of Surgery at our institution. The cohort included 1854 males and 557 females with a median age of 62.2 ± 9.9 years. Classification of tumor stages according to UICC 2002 was 41%, 21%, 21%, 6%, and 11% for stadium I, II, IIIa, IIIb and IV, respectively. Type of surgery consisted pneumonectomies in 18%, lobectomies and bilobectomies in 68%, and lesser resections in 14% of all cases. The date of definitive surgery was allocated to the days of lunar cycle as well as to the dates of the four main lunar phases, that are new moon (n = 89), waxing moon (n = 1058), full moon (n = 77) and waning moon (n = 1187). Patients were grouped according to these four phases, as described by Moore and coworkers . Patients long-term follow up was performed at our institution completed by data from the Munich Cancer Registry as well as updated by data from all GPs, community hospitals, chemoradiotherapy units and registration offices in Munich and its greater area. Median long-term follow-up was 25 months, ranging from 1 to 326 months. Since January 1996, detailed data of perioperative complications occurring during the operation until patients discharge from hospital were available for all patients (n = 834) included in our lung cancer database . General complications like dysfunction of the cardio-pulmonary system, myocardial infarction, dysrhythmia, pulmonary embolism, renal or liver failure, central nervous dysfunction, sepsis, pneumonia and postoperative bleeding requiring blood transfusion were recorded. Empyema, bronchopleural fistula, pneumothorax, chylothorax, wound infection, atelectasis or prolonged air leak, leading to an operative revision were generally classified as specific complications. Validity of data was assessed by comparing the four groups according to the distributions of main prognostic variables influencing long-term survival, morbidity and mortality in lung cancer patients (age, gender, TNM status, grading, completeness of resection status, treatment and histopathology). Statistical significance was evaluated using multiple logistic regression analysis . Rates and proportions analyzes were performed using the Chi-square (χ2)test. An univariate survival analysis for each prognostic variable on overall survival was estimated according to the Kaplan-Meier method  including 95% confidence intervals . The terminal event was death attributable to all causes. The statistical significance of the differences in survival distributions among the prognostic groups was evaluated by the log-rank test. The statistical difference was considered to be significant if the P value was below 0.05. Data were analyzed using MedCalc® for Windows, Version 9.2.0.1 (Med-Calc Software, Mariakerke, Belgium). With respect to the lunar cycle, there were no significant differences in the distribution of TNM-Status (P = .739), grading (P = .488), completeness of resection (P = .638), age (P = .706), gender (P = .273), treatment (P = .797) and histopathology (P = .466). Rate of intraoperative complications was 1.7%, whereas the rate of postoperative complications needing invasive or prolonged treatment was 16.4%. The 30-day mortality rate was 3.2%. Overall median survival was 28.7 months with a survival rate of 36.0% at five years. In contrast to age, gender, tumour stage, histopathology, grading and completeness of resection, which have been identified to be independent predictors affecting long-term survival significantly (Table 1), timing of surgery with respect to the moon phases showed no significant impact on long-term survival (Table 2). 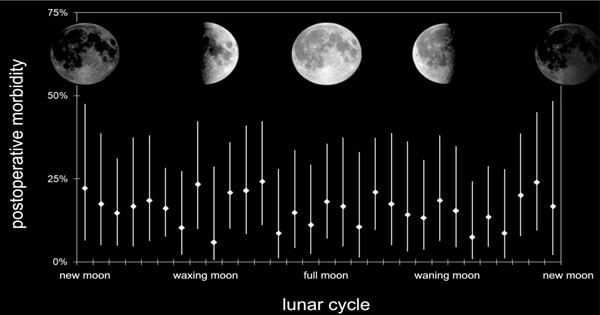 Outcome parameters are not significantly affected by moon phase. Lunar phases showed neither influence on intraoperative complications rate, nor on overall morbidity or mortality. However, as shown in Table 2 also allocation of patients to single days of lunar cycle as well as allocation to waning and waxing phases revealed no significant impact on surgical outcome. Rate of postoperative complications in % on each day of the lunar cycle when initial surgery took place. Rhombi indicate means of morbidity, whereas vertical lines show 95% CIs. Broad overlapping CIs indicate that there was no statistical difference between each day of lunar cycle (Chi-Square test: P = .846). This study revealed that moon phases had generally no measurable impact on outcome after surgery for lung cancer. In accordance to our results, Peters-Engl and colleagues , reporting their results on outcome of 3757 women operated for breast cancer, revealed no effect of moon phases on surgical or patient outcome. Arliss et al. examined the influence of the lunar cycle on the frequency of deliveries and delivery related complications, but also failed to demonstrate predictable influence of moon phases on patients included in the study. In addition, Kumar et al. report about missing evidence that full moon have significant influence on post-tonsillectomy haemorrhage. Postoperative mortality with respect to moon phases was analyzed by Smolle and coworkers , but they also failed to demonstrate an impact of lunar phases on outcome. According to these and other studies , there was no evidence in our series, that long-term survival was different in any of the four primary moon phases. The overall median survival in this study was 29 months with a 5-year survival of 36%, which is comparable to international reported survival rates after pulmonary resection for cancer [19, 20]. Román and associates  described that hospital admission for gastrointestinal bleeding was significantly increased during full moon. In our series postoperative bleeding events were not significantly more frequent during the full moon. To our opinion, this is due to the circumstance, that in the series described by Román et al. the bleeding event was definitively during full moon, in contrast to our study, where bleeding events were always linked to the moon phase at the time of surgery. In this study there was no evidence that outcome of surgery for lung cancer is affected by the moon. These results may help the physician to quite the mind of patients who are somewhat afraid of wrong timing of surgery with respect to the moon phases. On the other hand, locus of control is a well known individual factor within the coping strategies of many patients being in such desperate situations. In whatever these patients trust (internal LOC, powerful other's LOC or chance external LOC), it may supports them handling their disease. Therefore, patients who strongly believe in the impact of moon phase should be taken seriously and correct timing of operations should be conceded to them as long as key-date scheduling doesn't constrict evidence based treatment regimens.